Chesapeake Bay "Oyster Farm" - Are They Plants or Animals? Are oysters a plant or an animal? Many vegetarians eat them, claiming they reproduce like plants and feel no pain. We call an oyster producer an oyster farm, and small non-commercial oyster farmers call themselves "oyster gardeners." I recently talked with Karen Hudson of the Virginia Institute of Marine Science about the Chesapeake Bay’s oyster gardening programs, and whether or not she thinks the tasty bivalves are part of the plant kingdom. Chesapeake Bay residents who start an oyster farm or oyster "garden," has this grown in popularity? The Tidewater Oyster Gardeners Association has been around a long time. Their mission is educating people about growing oysters for the health of the Chesapeake Bay but also for enjoyment. They’ve been the force in that education effort in getting people interested. 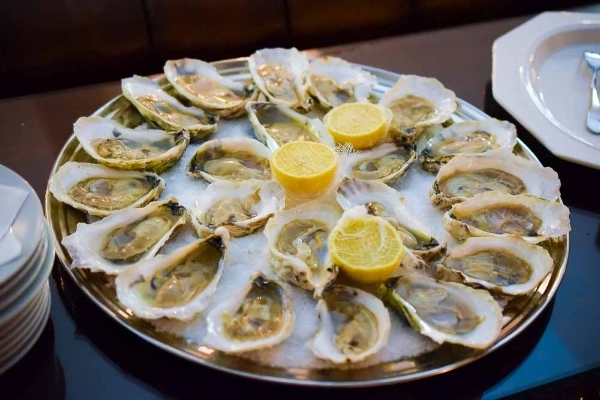 One thing TOGA has done to help the oyster industry was to increase awareness when the commercial oyster industry was setting flavor profiles for the eight different Virginia oyster regions. TOGA put on an oyster tasting with Virginia Tech. They host a tasting every year. There are six growers from different regions and they educate people about the different flavor profiles and how to enjoy them. Shuckers come and demonstrate, and they compete. They demo how fast and well they can shuck. Then people realize they can do this at home, have parties and serve different kinds of oysters. So that group, part of their mission is to look at the fun ways to enjoy oysters and the good taste of the Chesapeake Bay’s many different oysters. Chesapeake Bay oysters from Rapp Session restaurant in Richmond, VA.
Is oyster farming becoming more popular? There are constantly more people interested in raising oysters, and so membership in TOGA has increased. Now it's up to over 500 members. My role is to liaison with the academic community for education. For example, we put on a Master Oyster Gardener course for TOGA. For oyster gardening, the TOGA part, people learn how to garden oysters. They learn the nuts and bolts of where to get oyster seeds and how to get started. They also learn oyster biology, and what other critters live in the oyster garden. TOGA takes people who enroll in the classes to a research hatchery and see how oysters are hatched and produced. They study oyster larvae, the whole nine yards. We have guest speakers who come talk about the public fishery, oysters in general. We offer education on the rest of the story - not only the biology and ecology of oysters, but what’s happening in the broader spectrum of landings in the Chesapeake Bay. Why do you call an oyster farm "oyster gardening?" There's a difference between an oyster farm, which is a commercial production, and hobby farming. Gardening is non commercial. That’s an important distinction. You are raising the oysters for your own enjoyment, not for commercial sale. The oyster“gardening” education is similar to that for Master Gardeners. The idea was these will be Master Oyster Gardeners. You’re gardening, but in water. How do you start an oyster garden? There are two things we ask people to do: Get a no-cost permit to give the homeowner the right to put oyster floats at their dock for non-commercial purposes. Then we ask people to look and make sure they are in an area that’s safe to eat oysters. They need to look on map and call the Department of Health. There are great links online where you can pull up maps and see exactly where you are, and it’s very clear what’s good water and what's not. For non-commercial oystering - gardening - you can grow them anywhere. But if you’re in condemned waters the advice, of course, is not to eat them. Chesapeake Bay oysters from Big Island Aquaculture. How does raising oysters work? The site matters. For a dock you need to have at least a foot of water at low tide. Oysters want to be in an area with a good salt content, so if you are higher up in the fresh parts of the rivers, you have to be careful and double check the salinity. When it comes to methods, there are a lot of options. An oyster farm or garden can can have bottom cages, floats, bags, there’s really no one way to do it. You can play around with what you have available. Each has its advantages and disadvantages. When you’re at the gardening level where you’re not growing commercial quantities, it's less of a concern. When you’re closer to the bottom you can have mud worms and predators on your oysters. On top, the floating cages and bags, in some cases you can have river otters and other animals can get in. At the end of the day it comes down to what’s easiest for you to maintain at your site. Today’s oysters, if you get the hatchery-raised varieties, mature in 12-18 months. So you can start eating them within a year. So, are oysters a plant or an animal? Oysters are definitely an animal. I don’t know exactly how terms like "oyster seed" got initially coined. I guess it was copied after the plant world classifications, but I don't know why. Oysters have eggs and sperm, they have external fertilization, they fertilize in the water column. But they are dispersed through the tide. I guess I see a little of the thought process behind vegetarians not thinking of them as animals, however they are definitely not a plant.